But 2 nights before Valentine’s day rolled around, while perusing Instagram, I saw the below post from Rosedale Diner, and knew what our plans were. 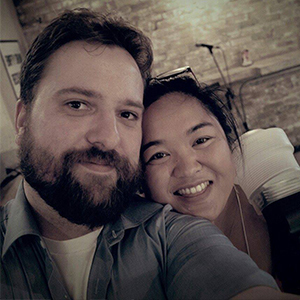 I have to preface this: the hubster and I /love/ Rosedale Diner. Their brunch lured us in: the Chicken Waffles brunch. ANYhoo, the Instagram post had both of us nervously wondering if we’d manage to get a reservation, as it had actually been posted the week before. Thankfully, online reservations exists, so I did just that. For us, it meant weaving through a maze of side streets (as some of those had been closed as well). We called the diner, to let them know we would be late due to the fire, but honestly didn’t have much to worry about at that moment. We were the only customers there when we got there. Our waiter told us that lunch time had been busy, as a lot of businesses had closed, and the people needed places to go eat. [D: still sad though, hopefully they still made out okay with the closures, it’s a big day to lose a bunch of reservations on, especially with how much prep I’m sure they did for dinner] But as 7:30pm is after work, the area was quite the silent night. 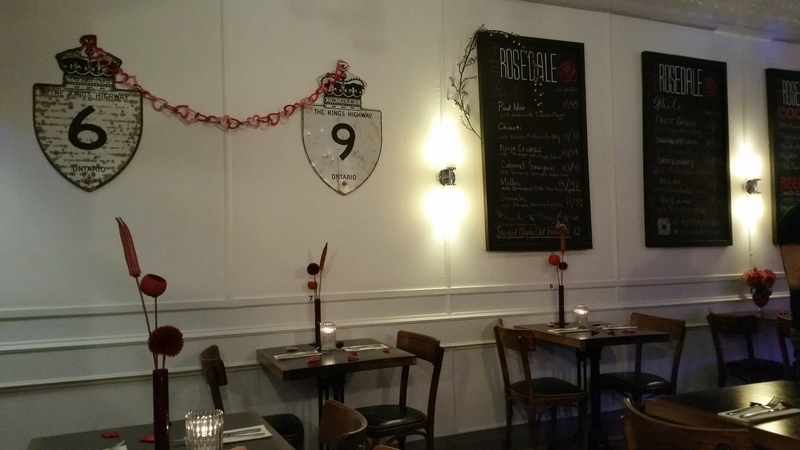 The diner was decked out for V-Day, and it was adorable. Due to us being the only ones there at that time, we had our pick of which table we wanted. We picked one in the corner, by the floating fireplace. 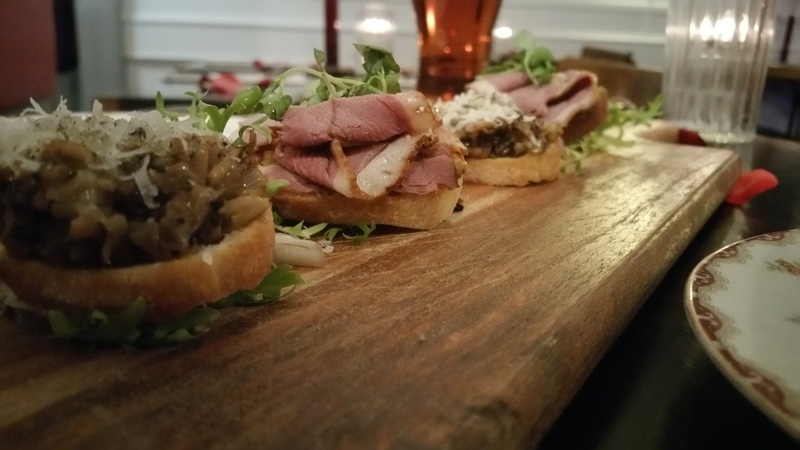 I think we can both agree that our favourite of the two crostini’s, was the duck breast. [D: no we can’t, the mushroom duxelles crostini was delicious, I do however love mushrooms surprisingly much] I usually love mushrooms and truffle oil, but it just seemed a tad bland. A little sprinkle of sea salt would have made it superb. I was lucky to eat that first, before the duck breast. I fear that if I had eaten the duck first, the mushroom crostini would have been very bland (D: Which is what I did… and it was bland). 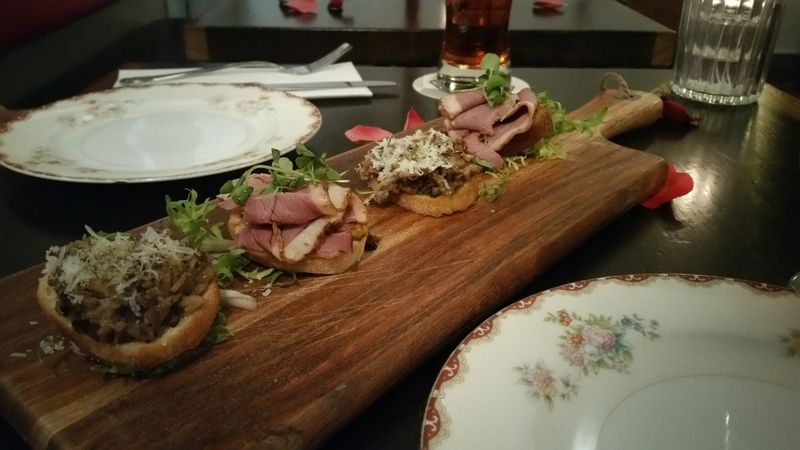 After finishing, we had a brief break to digest the crostini’s before being served our apps. If you know us/me, we/I always have to order whatever calamari app there is on the menu. 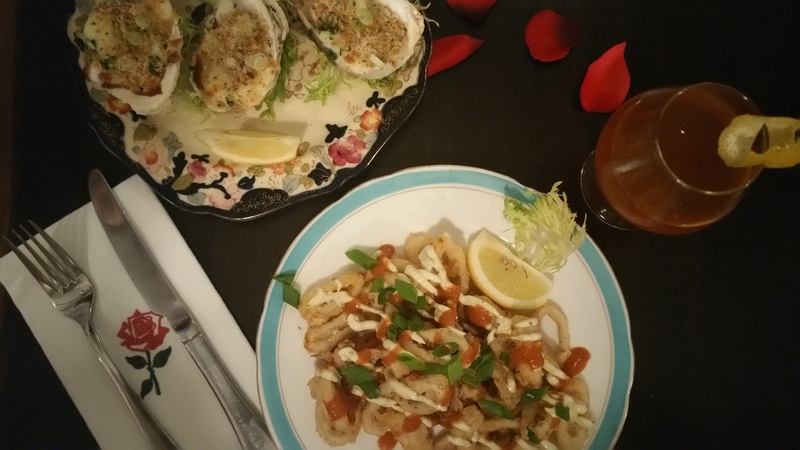 So that’s what I did, I ordered their ‘Calamari Picante’ (Chef’s hot sauce, lemon caper aioli), while the hubster ordered the ‘East Coast Baked Oysters’ (garlic confit, herbed bread crumbs, st. albert cheese). I have to admit one thing: I have had Rosedale Diner’s Calamari before. And I will have it again and again each time I go for a visit. [D: we usually split one, if only because their portions are generous, but I always have eto think about that for a while before we do, it’s really good, best calamari in the city that I know of] They never overcook it, which means I never have to worry about chewy, elastic-ilke tubes. 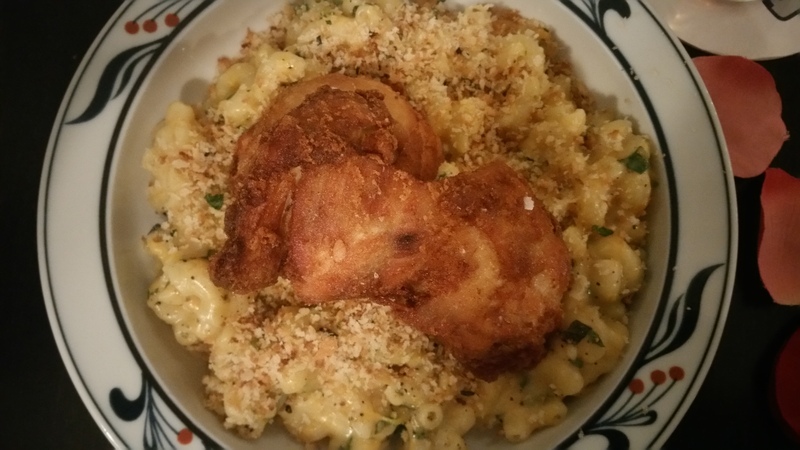 The chef’s hot sauce is a delight, and the lemon caper aioli balances it out perfectly. The Oysters, I did enjoy the one I had, but swallowed it too quickly, to really appreciate its taste. I had assumed, we were splitting our dishes evenly. Alas, David had other plans [D: I would have preferred more calamari, that was a huge mistake]. After finishing our appetizers, we had a little break, as more customers showed up. We were glad, as we thought it a shame that they had made a prix fixe dinner, and we were the only ones there for it. Our mains… can you guess what one of our orders was? 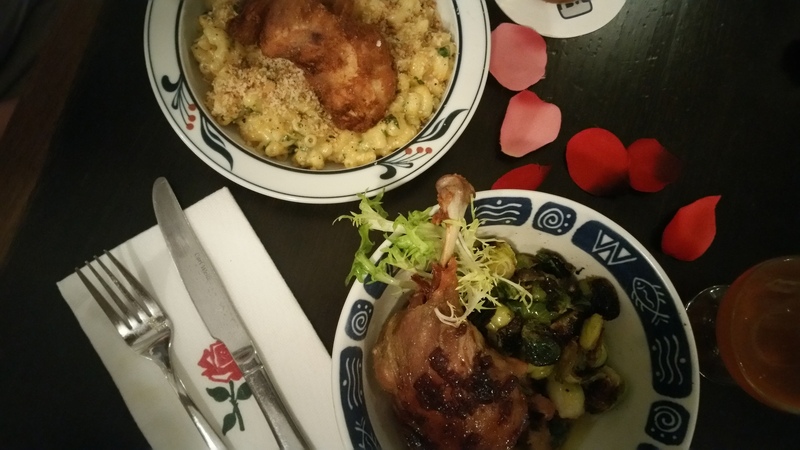 Obviously the Instagram photo we saw: The Buttermilk Fried Chicken Mac & Cheese (roasted butternut squash & five-cheese mornay, garlic & herb bread crumbs), and my choice: King Cole Confit Duck Leg (braised white beans, house lardon & sausage, roasted brussel sprouts, thyme cassis reduction). 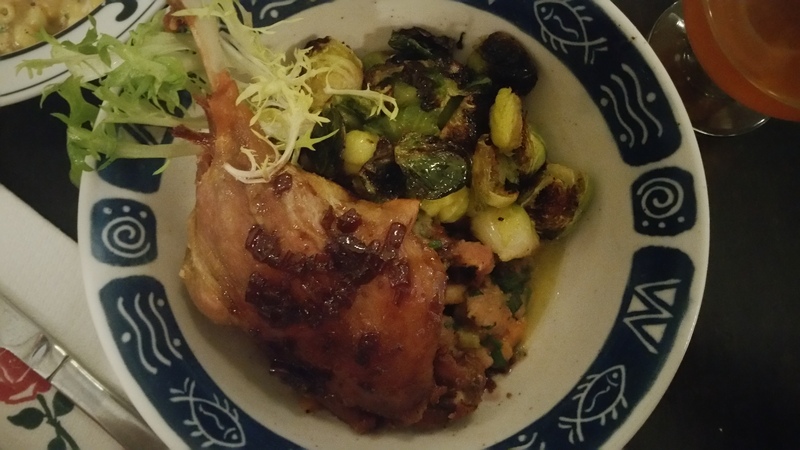 But if we were to talk about both dishes together, and what would make both of them fantastic, switching the chicken and the duck to the other dish, would have made bomb dishes. Which is what we did, since we were doing sharesies. 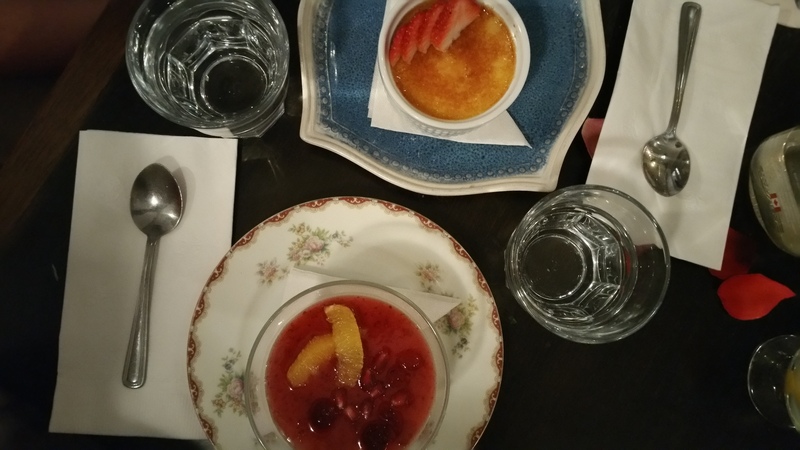 Last but not least, after our mains in our bellies, we had dessert: What I ordered: Rosewater Panna Cotta with pomegranate, mandarin, and cranberry compote What he ordered: Madagascar vanilla creme brulée with a strawberry rose. Can you see how I rounded out my meal? Ordered my drink with rose in it, and ended with rose. I do have to admit something though. My first spoonful was 95% rosewater panna cotta, with a bit of compote. 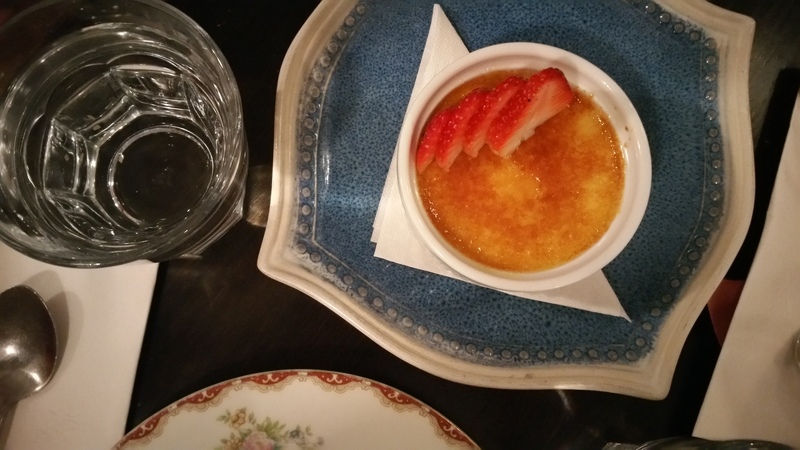 When I bit down/had it all in my mouth, it was a very strong flavour of rosewater. I love me some hint of rosewater in me desserts (like rosewater macarons), but this almost felt like a mouthful of pure rosewater. Which is SUCH a shame. [D: it tsteas like grandma] It made me weary to finish the rest of the dessert. 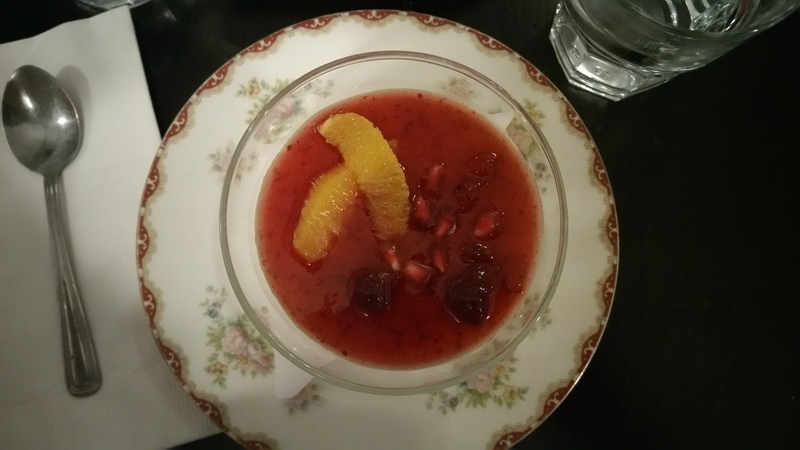 But I persevered, and I evenly proportioned the compote with the rest of the panna cotta, and the compote cut through the rosewater nicely, to avoid the overwhelming feel of drinking pure rosewater. Overall, we did truly enjoy our meal. We would, and will, go back to Rosedale Diner. We had some not so lovely things to say, but in the end, the meal was truly satisfying, and we love the place. D: Stellar as always, need to go back for brunch. Mmmm chicken & waffles..